It’s so hard being a girl. Don’t get me wrong, I enjoy being one but it can get pretty tiring. Just our personal care and grooming alone take FOREVER. How can they not? We need to wash this, apply that, comb this, wax that and so on and so forth. For a busy girl like me, it’s impossible not to miss a step or two. Usually, the step I forego the most is moisturizing. I’m always in a hurry that after taking a shower, I slip on my clothes and head out the door as fast as I can, completely forgetting to put on body lotion first. And when I do remember, I still fail to do it sometimes because I’d have to wait for my skin to absorb my lotion and I just don’t have time for that. I know I can always go out the door without waiting for it to dry but with our humid weather, it’s just not acceptable. I hate that sticky feeling I get whenever I wear my clothes before my lotion gets fully absorbed. But then again, no one wants dry skin. What’s a busy girl to do? Thank God for this little baby. 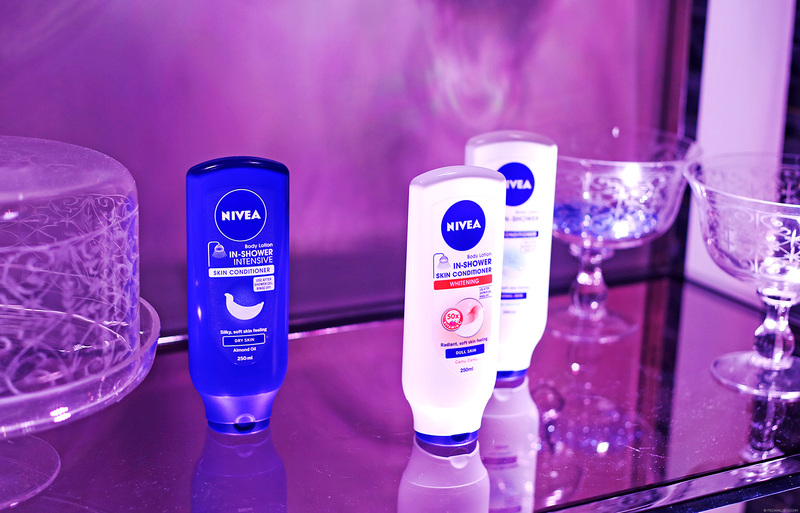 A few weeks back, I attended Nivea’s press launch introducing its latest skincare innovation called the Nivea In-Shower Skin Conditioner. Yes, you read that right! It’s basically a body lotion that you can apply while you’re in the shower!!! Gone are the days of having to wait around for your skin to absorb that greasy lotion of yours. This body product is for people like me who are looking for quick-fix solutions to their beauty routines. 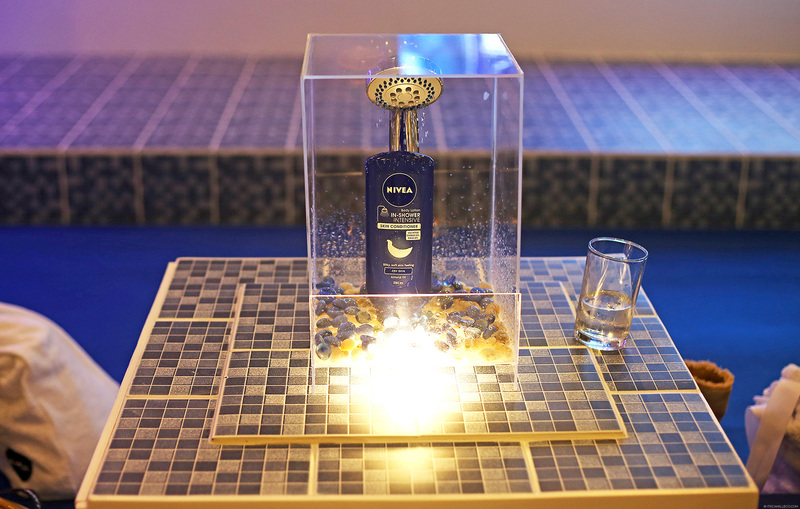 The Nivea In-Shower Skin Conditioner is activated by water and immediately absorbs into your skin. All you have to do is apply it to your body right after you cleanse with soap or shower gel and rinse off! You don’t have to leave it on for some time for it to work. It works immediately and leaves your skin feeling hydrated, smooth and soft right after rinsing. The Nivea In-Shower Skin Conditioner is enriched with special ingredients like Almond Oil, Sea Minerals and Camu-Camu so you’re sure that your skin is nourished and cared for without the hassle and stickiness. I got to try the product for the first time right at the launch. 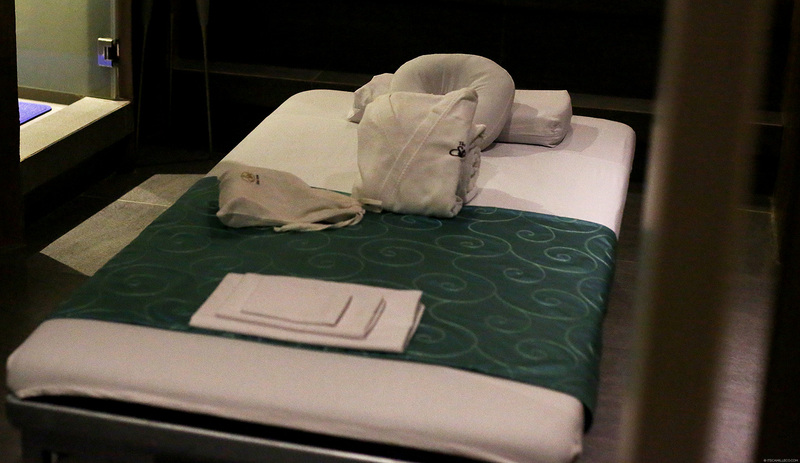 The experience was amazing because I used it after the free body scrub Nivea arranged for us at The Spa. The body scrub couldn’t have come at a better time. My skin needed some much needed TLC. To be honest, I was actually a bit skeptical to use the product at first. I kept asking my masseuse if she’s sure I can use the Nivea In-Shower Skin Conditioner inside the shower. LOL! I mean it’s such a foreign concept to me, and I’m sure for you as well. Won’t the moisturizing effect get rinsed off together with the product? How can it stay? How on earth is that possible? But to my surprise, it really works! My skin felt so soft and smooth–as if I applied my normal body lotion! Finally, I found the solution to my problem. I urge you to try it for yourself too! The Nivea In-Shower Skin Conditioner is available in 3 variants–almond oil for dry skin, camu camu for dull skin and sea minerals for normal skin. I used the almond oil for dry skin during the launch (and even until now). Check out its moisturizing effect on my skin below! These OOTD shots were taken right after the event. As you can see, it was a pretty hot and humid day but thanks to my new skin conditioner and my summery outfit, I’m fresh as ever! Me too!!! Great line of products! I hate that greasy feeling too! Thanks Ericka! Go try them! I can see you have new friends there, Jimmy Choo and Gianvito Rossi! I wonder who will be next? hahaha! I have the same dilemma with regards to applying lotion everyday. I can’t even remember when was the last time I apply?! I’ll definitely try this new innovation! I’ve been very bad with my skin for so long and I think it’s time to change! Haha! Thank you Kay! Time to pamper your skin, before it’s too late! Yes younger looking skin all the way! I hate that sticky feeling too. Especially for a commuter like me, it’s so annoying whenever I sweat, my lotion tends to become sticky kaya I don’t wear lotion in summer or when Mr. Sun is up very high. Haha I should try this nga and your thumb is weird but cute, I tried holding a bottle that way but my thumb didn’t bent the way your thumb bent. Amazebells haha btw, i love the breezy outfit! btw. what’s your hair color here? Thanks Kathe! :) Maybe someday! I’d love to see Colombia!